I adore a themed hotel when it’s done with style, respect and of course luxury; this couldn’t be more true of the gorgeous The Modern Times Hotel which is dedicated to Charlie Chaplain. 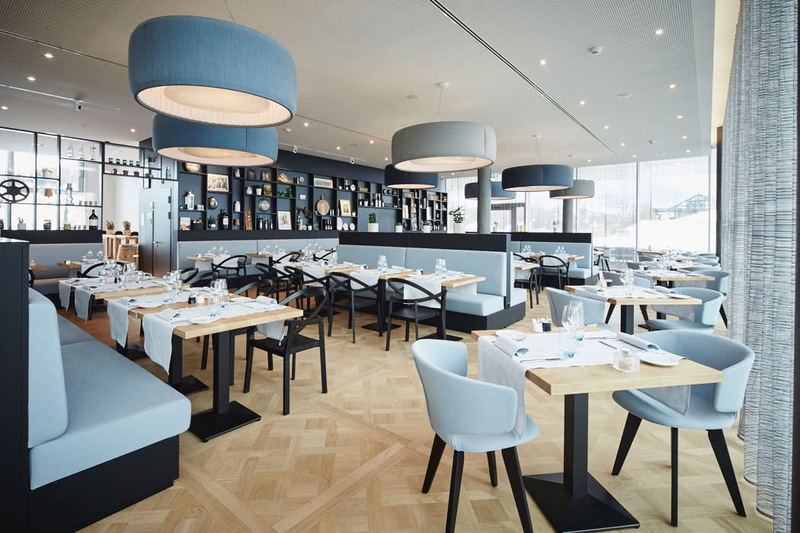 Located in the beautiful Swiss town of Vevey the hotel has an enviable lakeside position on Lake Geneva. 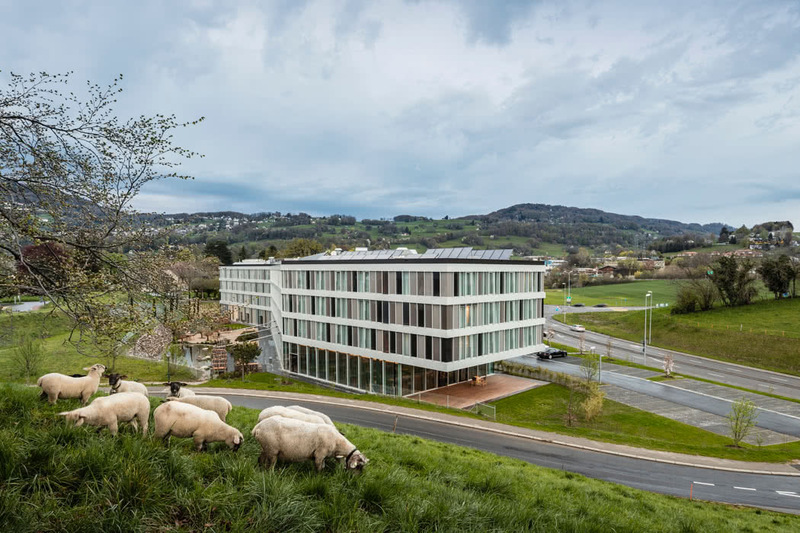 The hotel is located in the centre of the Vaud Riviera, at the crossroads between Geneva, Bern and the Valais in the chic town of Vevey next to motorway A9 between Lausanne and Montreux. The town itself is charming and the breathtaking Alpine panorama is (thankfully!) 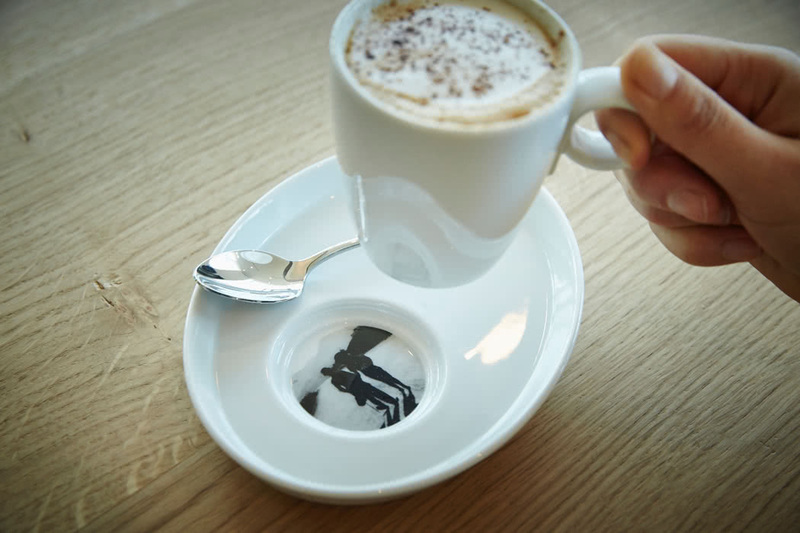 hard to escape. 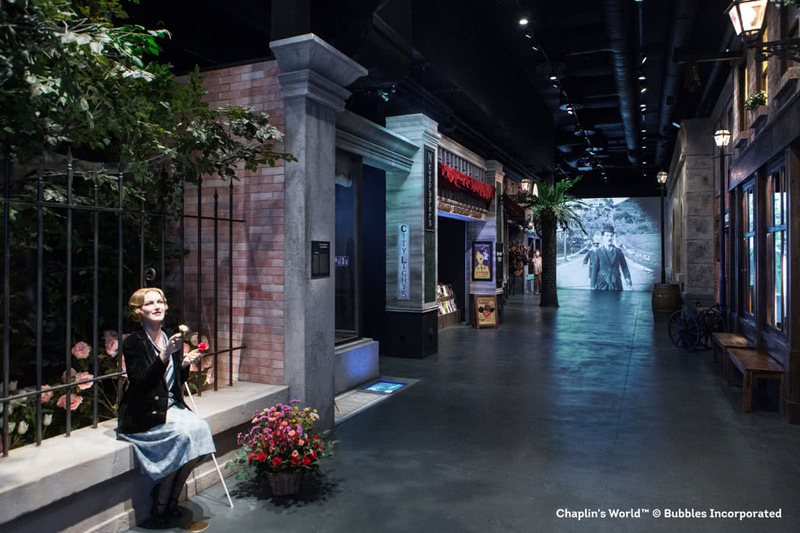 The town is also home to the Chaplin’s World Museum by Grévin which celebrates the life of one of the most astonishing and famous artists of the 20th century: Charlie Chaplin. 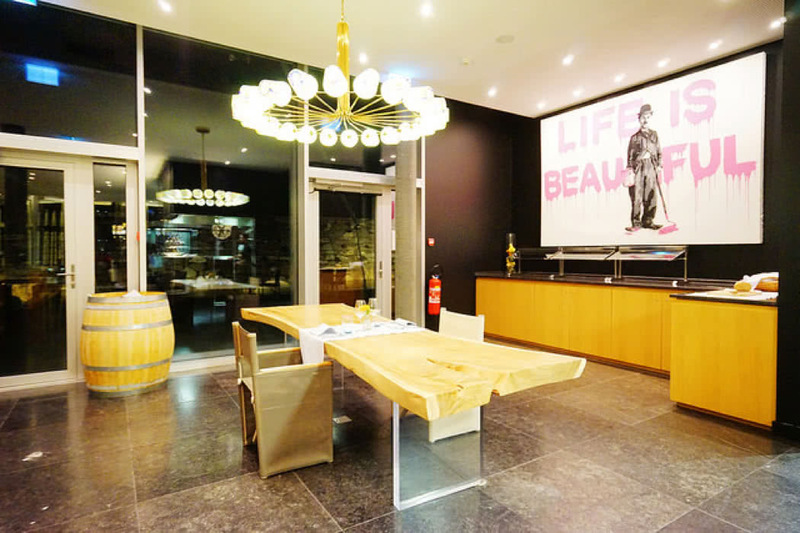 The museum is a must-visit, with over 3,000m² of space packed with multimedia experiences and discoveries, you gain a genuine impression of Charlie Chaplin’s private life in the Manoir and can also explore some of the studio sets of his greatest movies. 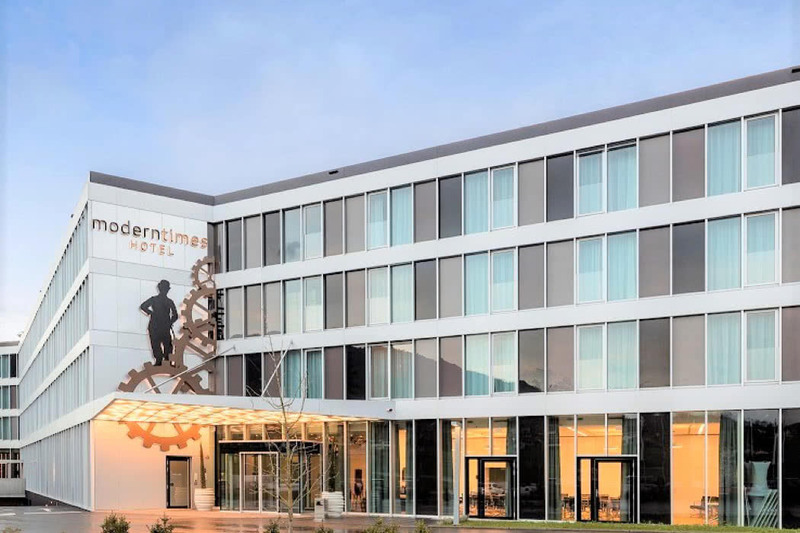 Modern in more than just name, The Modern Times Hotel was built in 2016 and boasts unique architecture with sleek and very stylish interiors. Guest rooms have leather surfaces, white oak floors and a colour palate of calming greys and neutrals. The hotel is of course dedicated to everything Charlie Chaplin. All the guest rooms feature pictures and video clips of his greatest films and everywhere there are delightful nods to the comic genius. The theming is very tasteful and makes it a really positive and uplifting place to stay. The hotel has a small but very well equipped fitness centre so you can stay in shape while you’re away. It’s also a great option for business with six spacious conference rooms which can also be joined to form three large rooms of up to 180sqm. There is parking for 120 vehicles both inside and out and they value their eco practises too so there are several charging stations for electric cars. A rather unusual but very useful facility provided here is fresh drinking water from their spring in Les Pléiades, simply refill the carafe in your room and choose still or sparkling water. The staff are friendly, professional and efficient, little extra requests are handled with ease and speed. 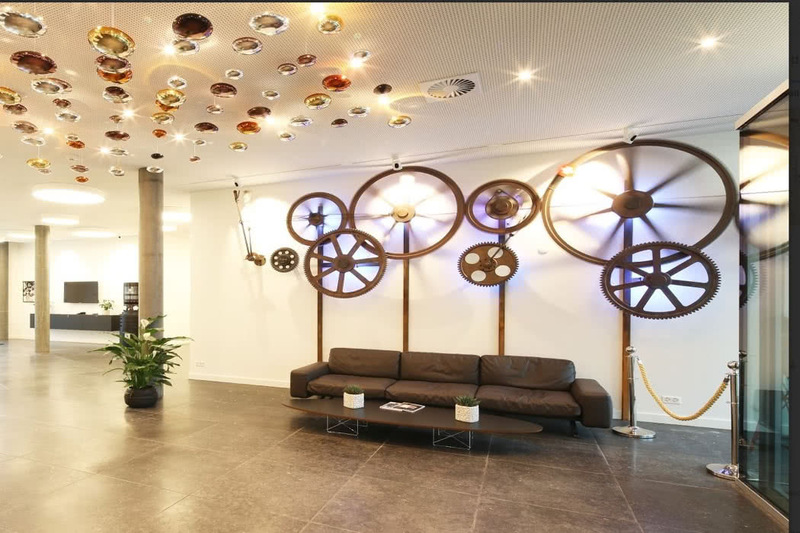 Accommodation at The Modern Times Hotel consists of 138 Rooms and Junior Suites. 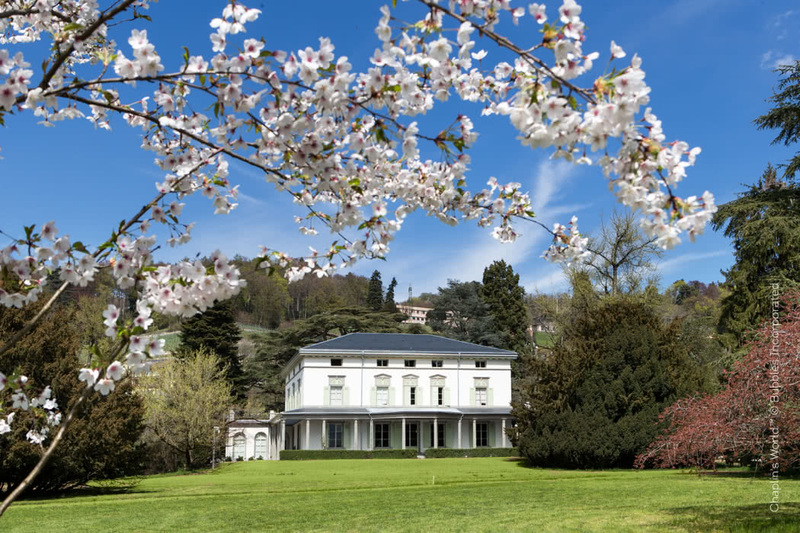 The guest rooms enjoy views of the gardens, Lake Geneva, and the majestic French Alps. All the rooms have the expected luxury travel amenities including complimentary Wi-Fi, comfortable beds, flat-screen TVs and Nespresso machines. If you are content with a Room then choose from Classic, Superior – with a better view or Deluxe/ Family Rooms with that bit more space making them ideal for families. If you fancy self catering or staying for a while then consider the Studio which comes with a kitchenette. True luxury travellers will, however, be seduced with the space, view and luxury that comes with the gorgeous Junior Suite. 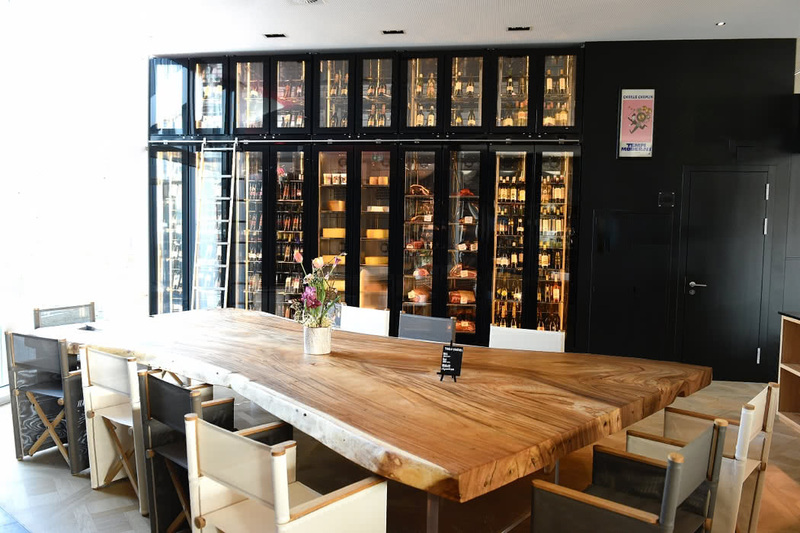 The very chic Times Bar & Lounge has a relaxed vibe and is the perfect spot to enjoy a cocktail or fine wine with a delicious snack on the side. For proper dining head to the Times Grill, an elegant restaurant which serves an exceptional steak that will please even serious connoisseurs. On warmer days you also have the option to dine al fresco on the terrace surrounded by the designer pond and Mediterranean garden.